There are no courts in crime-ridden Orange Farm, it emerged at a community event held at St. Charles Lwanga Catholic Church. The event revealed the urgent need for a court in the sprawling settlement of RDP houses and shacks, just 45 kilometres from the Johannesburg CBD. The discussion focused on access to justice in Orange Farm, examining the difficulties faced by this impoverished community who face rising crime rates and recent violent xenophobic riots. 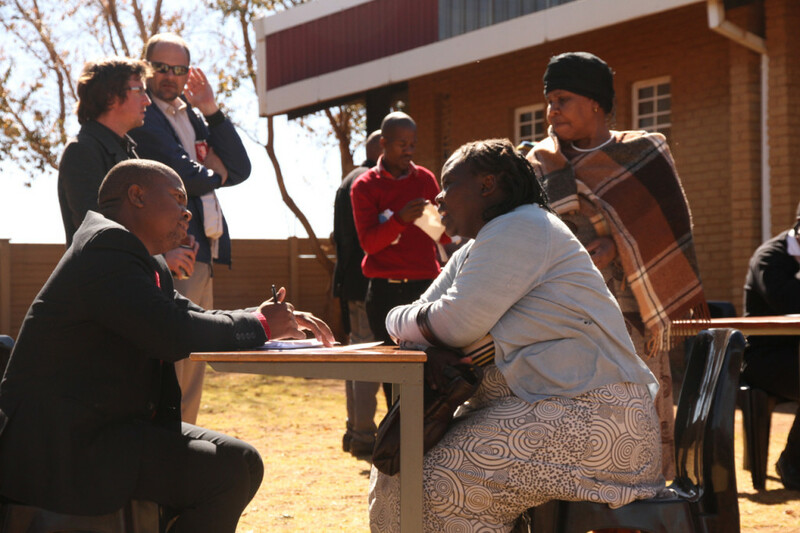 Legal Aid have agreed to visit Orange Farm once a month to provide free legal advice – a right enshrined in South Africa’s constitution – to those in need. The National Prosecuting Authority’s (NPA) Lilian Njoko-Moreki admitted that ideally there should be a court in Orange Farm, but emphasised that “for a fair trial, you must attend your trial”. She suggested community members lacking in funds should consult the local Police for assistance in attending their trials. 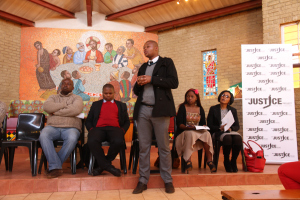 An event to discuss access to justice with the community of Orange Farm. The event was held at St. Charles Lwanga Catholic Church (Extension 7A) and was opened with a few spiritual songs and a moment of silence. Chaired by Jacob Sebidi, a member of The Southern African Catholic Bishops’ Conference, the panel included Mokolo, Lehlohonolo Mashifane Candidate Attorney at Legal Aid South Africa, Osmond Mngomezulu an attorney for Pro-Bono, Njoko-Moreki and Thandi Maduna, a producer for local radio station, Thetha FM. “We ask…the Department of Justice to build a court for the Orange Farm community” said Mokolo to thunderous applause. “There are people who aren’t even aware there are free lawyers,” added Mokolo. Following the discussion, community members received free legal advice under a tree in the church’s dusty courtyard. “If they can’t come to you, you have to go to them,” said Legal Aid’s Manaba. The aim of the event was to listen to the issues facing the community and try to help them find solutions and a way forward. The WJP has been hosting a radio show (http://witsjusticeproject.com/2013/04/18/wjp-partners-with-thetha-fm-a-small-station-making-a-big-impact/) on Thetha FM- Orange Farm’ s community radio station- every Tuesday at 13h30, that helps people to deal with justice issues ranging from “ What if you can’t afford your bail” to “ Has the case you opened with the cops gone nowhere”. The WJP team decided it was time the community knows who we are, what we represent and we got to know the community of Orange Farm better. 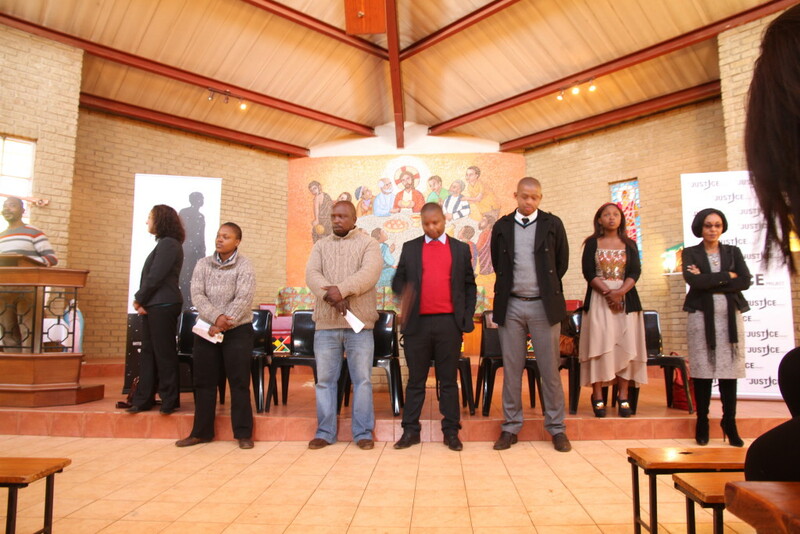 We invited speakers from different organisations to help community members with their issues on accessing justice. 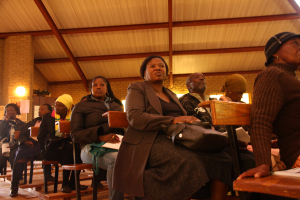 The meeting was chaired by Jacob Sebedi from the Justice and Peace arch diocese of Johannesburg, who would summarise what the speakers had said and translated it into SeSotho. Opening the session was Nooshin Erfani-Ghadimi, WJP Project Co-ordinator. She explained to the community that the WJP is not a legal firm, but a group of journalists and researchers, who have access to lawyers, legal experts and who focus on human rights. She said that what we learn from Orange Farm will be shared with others through the media, using newspapers, radio, television and social networks. Speaking at the same time, Palesa ‘Deejay’ Manaleng – an intern at WJP -, explained in Sepedi that the Justice team is made up of ordinary people, who at one point did not understand and know much about the Justice system. After a lot of research and through asking the correct questions to the right people, we have been able to gather enough information to enable us to come to Orange Farm and share our knowledge with the community. Bricks Mokolo, a community paralegal, let the community know that this is not about just access to justice for Orange Farm but for other communities. He said: “we have a police station but we feel we have no access to justice”. And to thunderous applause, he continued: “we want a court, we ask, demand, that they build a court here”. Speaking after Bricks, Osmond Mngomezulu, an attorney for Pro-Bono, discussed access to lawyers and courts. He began by explaining that in South Africa we have a Constitutional rights. But, he said, even though we had rights, the biggest challenge was accessing those rights. He explained that every lawyer is obliged to provide 24 hours of free legal service a year. Lehlohonolo Mashifane, from the Vereeniging Justice Centre of Legal Aid SA, explained the work of Legal Aid. Afterwards, he and his colleagues said they would try to visit Orange Farm once a month, to listen to the community and give them legal advice. Thandi Maduna, a producer at Thetha Fm passionately spoke about different issues she witness on a daily basis. “We are focusing on Nyaope (heroin mixed at times with rat poison), but some cops take bribes from drug dealers. She continued by encouraging the community to come to the radio station to give voice problems they are facing. The final speaker, the dynamic Lilian Njoko-Moreki, from the NPA in Vereeniging discussed access to courts and how courts interact with police. “We can see Orange Farm is growing and needs a court , the issue of no courts in Orange Farm affects us as prosecutors as well”. She asked the community to “work hand-in-hand with the police and the NPA and the Legal Aid, to help see that justice is served in this community”.